"Where did you get all those muscles from?" 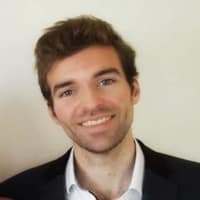 your friends ask, as if you purchased those biceps for 0.42 Bitcoin from a muscle-seller around the corner. As if it wasn't the months of dedication in the gym, hundreds of burpees, thousands of dumbbell curls 💪. Or "How did you get so good at coding? ", as if you bumped your head against a door and it activated the C++ part of your brain. As if it wasn't the hours spent on Stack Overflow, the nights searching for that missing comma the frustrated squashing of bugs 🐛. Meaningful change is a process. It never happens suddenly. But if you don't document the small bits of work you put in every day, you'll lose track of your progress. You'll become demotivated, because you can't look back and see how far you've come. You'll unwittingly stop doing what made you successful, what makes you happy. That's why everyone at X-Team journals 📕. And it's been a game changer. You see, we don't journal the usual way. We've upgraded journaling, if you will. Journaling 2.0. The title gives it away, but we journal on Slack. Because it's 2018, come on! 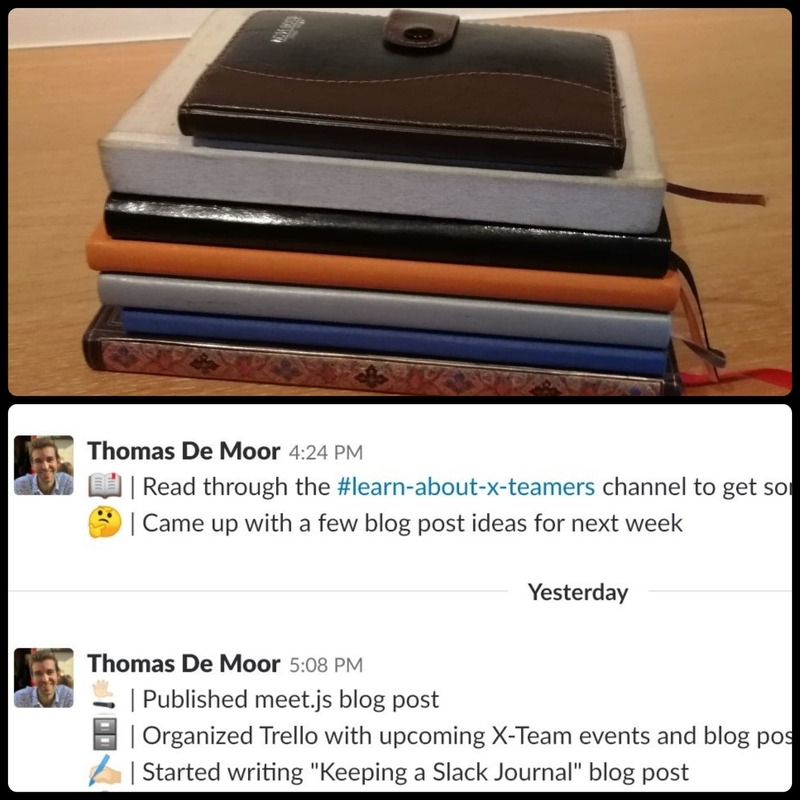 Aside from the surprising health benefits of regular journaling, journaling on Slack has been a key ingredient in making X-Team a community of people that trust each other. Here's how it works. Firstly, we have "Today I Learned" (TIL) notes. They're the little learning moments scattered throughout the day, those golden nuggets that disappear if you don't quickly record them on Slack. These notes are quick and raw, the reports from the battlefield. Secondly, we have reflections. You're sitting victoriously on top of your conquered mountain 🗻, sipping tea from a china cup and looking over the battlefield. You think about the things that went well and the things that didn't go well. But most importantly, you formulate in words why it went the way it did. Sometimes you instinctively feel a piece of code, for example, isn't quite right. Don't let those moments slide by! Write down why you feel that way. It's a powerful way to learn. Most of our Slack journals are available to join for X-Teamers. And all Slack journals have at least two people added to it. It has drastically reduced the need for time-consuming meetings, because the relevant people are always up to date. They know what you're working on. It's a two-way street too. If you're stuck, we encourage you to write it in your journal. Someone will jump in and help. Works gets done faster, because your colleagues can share their relevant experience and point you in the right direction. Journaling on Slack is the 2.0 way for a remote company to exist. It increases trust, reduces stress, and helps get work done faster. Combine all those X-Journals together, and you have a veritable treasure trove of learnings. Do you journal? Let us know in the comments 👇!